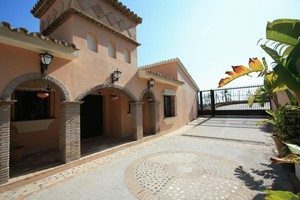 Here is a selection of Spanish properties. Beautiful family villa, fully refurbished with a delightful garden and open views, 6 bedrooms, 6 bathrooms. Beautifully presented family Villa in a large plot enjoying fabulous coastal, mountain and golf views. The house has been fully refurbished and has beautiful gardens. 6 bedrooms and 6 bathrooms, spacious living rooms and terraces. This is a superb family house situated in a large garden plot affording superb open views. The property has been refurbished out with luxury bathrooms and a fully fitted kitchen and we recommend an internal inspection. The accommodation comprises a covered entrance area, hallway with guest w.c., large lounge with open fireplace and access to a covered terrace, separate dining room and kitchen with fitted units, granite work surfaces and appliances including oven, hob, microwave, dishwasher and american style fridge freezer. Breakfast room with access from the parking area, 2 bedrooms, both with bathrooms en suite. Large guest bedroom suite with en suite bathroom and access to the terrace. On the lower level there is a master bedroom with fitted wardrobes and en suite bathroom and two further bedrooms both fitted wradrobes and en suite bathrooms. Large family living room and study with access to the pool and gardens. Utility room with washing machine and dryer. Storage rooms. Delightful gardens with open views including a vegetable garden. Extensive pool terrace with open views and barbecue house. Gated entry with parking space for several cars. Hot and cold air conditioning, quality marble floors, under floor heating in the bathrooms plus solar heating for all hot water. Over 23,000 Spanish properties are available in our main property database. Situated in the area of Benahavis Town Hall. Superb unit priced to sell, 2 bedrooms, 2 bathrooms ground floor, garden and sea views, complex offers indoor pool, gym and 24h security. Priced to sell this superb unit in Capanes del Golf, this is a prestigious community of apartments and penthouses, situated to the west of Marbella overlooking the new Marbella Club Golf Course. The apartments are situated in impressive mansion style buildings and the community features a superb gym and indoor pool in addition to the usual gardens and outdoor pools. Gated community with 24 hour security. Spectacular well laid out ground floor corner apartment with direct access to the gardens. High quality accommodation with the principal rooms including the kitchen all opening onto the part covered, part open terrace. Entrance hallways, large lounge/dining room, kitchen with granite worktops and Siemens appliances including oven, hob, fridge freezer and dishwasher. Guest toilet and two bedrooms, both with fitted wardrobes and en suite bathrooms with under floor heating. The second bedroom has access to an own private covered terrace. Garage parking space and adjoining storage. Unique free bee is the very large store room (104m2) immediately adjoining the apartment which could be made into a cinema room, gym etc. Cream marble floors, hot and cold air conditioning, under floor heating in the bathrooms. 120 m2 living area + 56 m2 of terrace. Fantastic Opportunity, 4 bedroom, 3 bathroom apartment in luxury community with walking distance to beach. This fantastic beach side 3rd floor corner apartment is situated within walking distance to all amenities, Puerto Banus and only a short stroll to the beach. The property compromises of, entrance hall, a fully fitted kitchen with breakfast area and adjacent laundry room, large lounge and dining room with direct access to a wrap around terrace, guest toilet, Master bedroom en-suite with shower and jacuzzi, 2nd bedroom with en-suite shower and 2 further bedrooms with a shared bathroom with shower. Built in wardrobes in all bedrooms, domestic system through out and individual A/C hot and cold in each room. The complex is built in a U shape with communal pool and gardens in the center offering a large building with room for meetings, private events etc. in this same building you will find the indoor pool and spa, a community gym fully equipped to the highest standards and changing rooms for ladies and gents. Superb 3 bedroom, 2 bathroom duplex penthouse, well located with short walking distance to the beach and with spectacular sea views. Enjoy the spectacular sea views from this well-located duplex penthouse. Very short walk to the beach. Ideal holiday home! The community provides 24-h security, large swimming pool + one children´s pool. Among the fixtures and fittings are A/C hot and cold, alarm system, blinds in the bedrooms, double glazing, marble floors, satellite TV, video entry phone, etc. The property comes with a parking space + storage room in the underground garage. The property offers on entry level a bright lounge with dining area, a fitted kitchen with utility room, one guest toilet. The lounge opens on to a lovely open terrace. Upper level comprises three bedrooms, all with built-in wardrobes, the main bedroom is en-suite. All 3 bedrooms enjoy access to open terraces. Built 131 sq., Terraces 35 sq., 3 bedrooms, 2 bathrooms, 1 guest toilet. 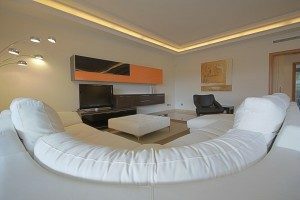 Impressive duplex penthouse, 3 bedrooms, 3 bathrooms, panoramic views, exclusive complex with indoor pool and tennis court. Impressive duplex penthouse, built to high specifications, quietly situated in exclusive Albatross Hills, one of the landmarks of Nueva Andalucia. The stunning complex provides vast landscaped gardens, several large outdoor pools, indoor heated pool, 24-h security with CCTV, on site security guard, tennis court, etc. Layout: Entry level comprises an entrance hall, a completely fitted kitchen with breakfast area and utility room, a grand lounge with separate dining room, 1 bedroom en-suite and 1 guest toilet. Top floor comprises further 2 bedrooms en-suite, both opening up to terraces. Qualities: A/C hot and cold, alarm system, built-in wardrobes, cream marble floors, double glazing, electric blinds, intelligent system, jacuzzi, satellite TV, etc. Views: Impressive views to the mountains and the coast. The property comes with 2 parking spaces + 2 large storerooms in the underground garage. Excellent duplex top floor apartment, 3 bedrooms, 3 bathrooms. 24h security, gated complex, paddle tennis and tennis courts within complex. Excellent duplex top floor apartment in a 24-h security gated complex neighbouring Atalaya Golf off the Benahávis road. 3 bedrooms and 3 bathrooms, all en suite. Easy access to al amenities yet in a tranquil location close to Atalaya Golf Course. This immaculate well presented property features a fully new fitted open plan quality kitchen with appliances including an oven, hob, microwave, dishwasher and American style fridge/freezer with ice maker. Spacious and very bright living- & dining room which opens up to the open west facing terrace, two bedrooms, and two bathrooms which are both en suite on the lower level. Upstairs The master bedroom has an extensive range of fitted wardrobes and a bathroom en-suite with bath and walk-in shower. Accesses to 2 terrace. The main terrace area is spacious and enjoys all day sun. Built in barbecue and Jacuzzi. Among the fittings are marble floors, alarm system and air conditioning hot and cold. Working Fireplace. The complex offers massive, beautifully landscaped gardens with 3 community pools, paddle tennis and tennis courts. A brilliant choice for the family looking for plenty of outdoor space, the golfer who wants to be next to a whole range of golf courses, etc. Built sq. Terrace sq. Roof terrace sq.